There are two MAJOR opportunities that are in front of us at Christ Community Church in the next 30 days. Please add these to your calendar and help us celebrate and serve! 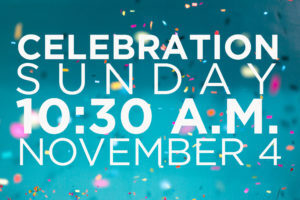 We will celebrate two important milestones in our church on Celebration Sunday: our 33rd birthday and the end of our We Believe giving campaign. I’m a strong believer in stopping to give thanks to God for His faithfulness in giving our church such a strong history in our community. We want to praise him for where he has us and pray together for where he’s taking us! We will celebrate his goodness and grace together on this day! We will also be celebrating the end of our 1-year giving campaign called We Believe. God has provided in amazing ways this year, reducing our debt for the purpose of advancing His mission through us. If you have not completed your commitment to We Believe, you can do so by giving onlineor you can bring your gift on November 4th. If you want to make a special end of the campaign gift, you can do so on or before Sunday, November 4. I will be sharing an update on where we are and how the Lord has answered our prayers about reducing this debt. November 4 will big day for our church! Please save the date and make this Sunday a priority. I would love to see everyone there at the same time on the same day to give God glory for His faithfulness. On Sunday, October 28, we will pass out brown paper grocery bags and provide you with a list of Thanksgiving meal items to fill each bag with. We are asking as many people as possible to fill one bag full of Thanksgiving groceries to feed a family. One bag should cost about $25 or less. 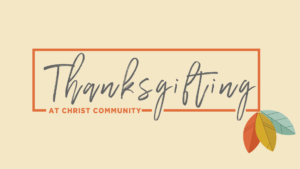 After you fill the bag, bring it back to the church building and we will distribute these at a special Thanksgiving service on Sunday, November 18th, at 2:00 pm. At this service, we will share the Gospel – while giving them physical food, we want to nourish them spiritually as well. This is an all-hands-on-deck ministry, so we need as many people as possible to make bags, distribute flyers/door hangers, and serve on the day of the event. More information will be coming soon, including a registration link for you to sign up to serve! We are excited and expectant to see how God uses us through this event to advance the Kingdom, and we hope you’ll be part of it. Finally, this Sunday we will be in Mark 9:1-13, looking at the transfiguration of Christ. 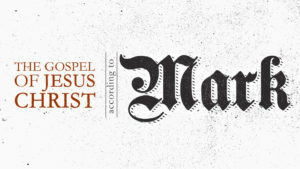 It’s an interesting story in the middle of Mark and has a lot to teach us about who Jesus is and what he’s come to do. It’s looking like it will be finally be a nice, cold Fall morning on Sunday, so get up, pray up, bundle up, coffee up, and join with your church family to worship King Jesus!